The fire took hold in the Craigowl Hill area, several miles north of Dundee, on Friday. 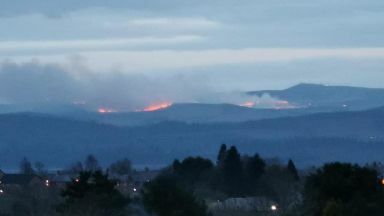 Eight fire crews were sent to battle a blaze in the Sidlaw Hills in Angus. The fire took hold in the Craigowl Hill area, several miles north of Dundee. Emergency services were called to the scene just after 6pm on Friday. They have now left the area, but will return in the morning to reassess the situation. A spokeswoman for the Scottish Fire & Rescue Service said controlled heather and gorse burning got out of control on rural land. She added: "We received a call at around 6pm and initially sent two appliances. One was from Kirriemuir and the other was from Forfar. "They requested additional back-up, so eight were sent in total. "The fire front was around two miles in area. "We have left the scene, but will be back out in the morning to reassess the situation." Linda MacDonald posted a picture of the blaze on social media. She reported seeing white smoke in the afternoon, which shortly turned to fire.